Martha Lemasters, author of The Step, at work for IBM at the Kennedy Space Center during the Apollo Progam. By the 1970s, pantyhose were a staple in every woman’s wardrobe. 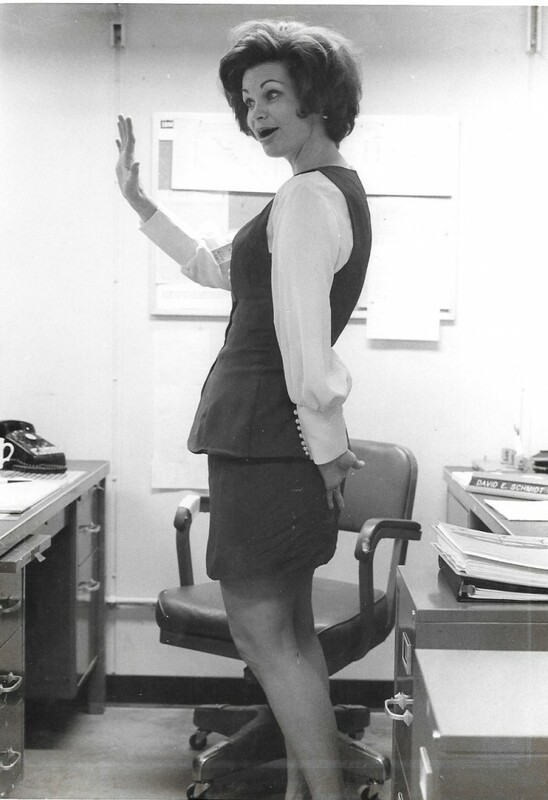 As more women headed into the workplace, sales of pantyhose grew. The only problem was that there wasn’t very good elastic in the waist and they would start to droop to your hips if you didn’t pull them up! The day has finally arrived for my first business trip. I am to go to Bethesda, Maryland, just outside D.C., to sit in for the communications manager for one week. I am confident. I have learned to become assertive and stand up for my rights. I am so excited; I feel I’ve earned this trip. I know I’m a professional woman now. I’ve developed my creativity and knowledge. I pick out my best business suit to wear; every strand of hair is in place. Even my attaché case matches the overnight bag I carry. In short, Doris Day couldn’t look any more perfect for the part of a traveling professional woman. I am to leave from the Melbourne airport, fly to Atlanta for a change to Washington, D.C. I check my suitcase, board the plane and I’m on my way. I expect the trip to be easy but once over Atlanta we have to circle the airport for more than an hour, slipping my boarding time for my next flight to D.C. I now have only three to four minutes to make that flight. As I descend the stairs from the plane, I think I can make it. I am feeling important as I look around and see most of the passengers are men. I hold my head up high and then it happens. With my overnight case in one hand and my attaché case, as well as my huge handbag in another, the elastic in my pantyhose breaks. Hovering over I use both elbows to pinch each side of the pantyhose to keep them from falling down. Hurrying through the airport the vision is not exactly what would appear on the cover of New Woman Magazine. My 5’9” frame stooping over, elbows in place holding the pantyhose up and scurrying as fast as I can. I know I don’t have time to stop and take the pantyhose off because I will miss my flight. I finally make it to the plane. One of the flight attendants comes over and asks “Are you in pain”? With these words ingrained in my thoughts, I make a beeline to the rental car agency as soon as I land. I get the keys and hurry to the huge parking lot. It takes me a while to even find the car; then I have trouble getting the car started. A man passes by and I ask him if he knows the secret to starting the car. “You’ve got to have your seat belt on,” he says. I feel so ignorant. But I think the procedure, obviously installed by the rental company, even more stupid. I get started and head out of Washington. I travel about 30 miles, happy that I’ve beaten the worst of traffic when it hits me. I have forgotten my suitcase! As I approach a road sign that reads Manassas, I realize I have also traveled south, instead of north. I travel for another few miles before I can get off and turn around to go back to the airport. My lips start to quiver, tears are coming down my face, destroying my image as a professional woman entirely. As I pull up to the area designated for arriving passengers, the porter comes up to the window of my car and all my professionalism goes out the window. My chin is even quivering, my bottom lip protrudes and I just break out crying. “I left my luggage in the airport, drove 30 miles in the wrong direction and I don’t know how to get my luggage or even get out of this place and drive the right direction. Can you please help me”? “Of course I can,” he says gently. “Let me have your claim ticket.” I quit sniffling, give him my ticket and wait in the car. In a short time, he returns with my suitcase and puts it in the back seat. “Now, where is it you’re supposed to go,” he says. “Bethesda,” I softly answer as I hand him a $10 tip. Well, so much for being professional. I finally reach the six-story hotel and check in. It is December and I think it’s very cold but then I’m a Florida gal, I think it’s winter when the temperature reaches the fifties. The temperature is 31 and sinking according to the TV in my room. I decide to eat in the hotel restaurant not wanting to venture out on such a cold evening. After dinner I go to bed early to get a full night’s rest so I can make a dynamic impression with my energy and promptness the next morning. Talk in the next room awakens me. I glance over at the red dial on the clock and see that its 2 a.m. I imagine the talking is from a late night party someone is having, as I can even smell the smoke from their cigars and cigarettes. “The hotel is on fire! Get a coat on and evacuate the building at once,” comes his frantic cry. I am dressed in my Florida-style shorty nightgown. My coat, also made for Florida, is thin and falls just below my waist. I packed my new bra and my new tennis racquet. It is a toss-up as to which item to grab to take with me. I put my coat on and grab my beloved racquet and purse and head out the door to the deafening sound of the siren. I am also barefooted and barelegged. The hallway is filled with men, some half-dressed, some half-asleep, some half-drunk, all very anxious. They all head to the elevator. “No,” I yell, remembering my safety training. “We have to take the stairs.” About 30 people cram down the stairs, jumping two and three steps at a time. Once outside I see five fire trucks surrounding the building. One is a hook and ladder, perched at the top floor with the fireman knocking on the window, trying to wake up the people inside. It is freezing and there is no place to go inside. Out of the whole crowd of hundreds there are three women. At least they have on full-length warm coats. I notice the strange things that the crowd has managed to bring with them: bottles of scotch, whisky, shoes in hand. And I stand here with my racquet. The fire department is providing oxygen to some of the people who have inhaled smoke. One fireman comes over and asks, if I need artificial respiration. I wonder why he is asking me that, I’m not coughing or slow of breath. I relate it to walking across the catwalk at the VAB. Gene, my contact, arrives in about an hour with a green and blue stripe dress and shoes. The shoes weren’t too bad. The dress was about two inches short-waisted and another two inches too short in length. It was also very tight around my hips. I looked like a refugee from Goodwill. Decked out like this, I drove the car to the building and head straight to the receptionist. I resolve to hold my head up and just get on with the day. “Can you direct me to the Personnel Office,” I ask. “Oh honey,” she replies, as she looks me up and then down. “We’re not hiring today. The following are excerpts from The Apollo Missions, written by Jim Harroun. The historical, cultural and scientific significance of putting a human on the Moon is hard to overstate. It took the efforts of thousands of individuals to achieve such a feat, and it opened the heavens to possibilities never before imagined. The Apollo 11 lunar landing was an international spectacle. Millions tuned in to watch the events unfold on television. 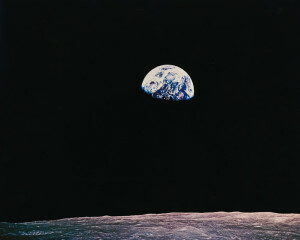 At the time, the world was abuzz with talk of landing on the Moon and the possibilities of space travel. Today, the Apollo 11 mission is ingrained in humankind’s collective memory and an unforgettable moment in the world’s culture. It was, and forever will be, a testament to what can be achieved through science, engineering and a will to achieve. More than 4000 IBMers worked tirelessly to help humankind put a person on the Moon. Countless others from NASA, contracting companies, government and the international community provided the technological, monetary and political resources necessary to achieve this unprecedented accomplishment. Below are the main groups of IBMers involved. IBMers at the George Marshall Space Flight Center in Huntsville, Alabama, built the Saturn V instrument unit that launched the astronauts and put them on their course to the Moon. 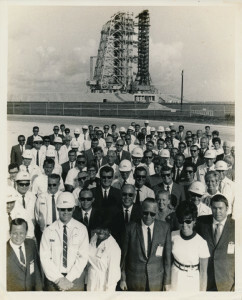 IBMers at Cape Kennedy, now Cape Canaveral, Florida, performed final system tests and helped launch the 3000-ton rocket with its 40-ton payload. At NASA’s Manned Spacecraft Center—now the Johnson Space Center—in Houston, Texas, IBMers worked beside flight directors to analyze the data that would navigate the astronauts from Earth’s orbit into lunar orbit and back again. IBMers in Owego, New York, and other locations invented and built miniaturized integrated circuitry for the Saturn computer. They shrunk a computer the size of a restaurant refrigerator down to the size of an average briefcase—and made it rugged enough for space travel. 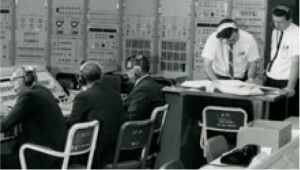 IBMers at the Goddard Space Flight Center near Washington, DC, developed the Goddard Real-Time Systems for the Apollo missions. Their computers processed data from radar stations, remote sites and tracking ships—a worldwide network to track the Apollo missions. Landing the first two astronauts on the Moon in July of 1969 ranks as one of the great engineering achievements in human history. 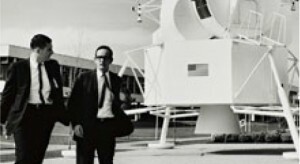 Learn more about IBM’s role in NASA’s Apollo missions from an IBMer who helped make them possible in this clip from the IBM Centennial film, They Were There. 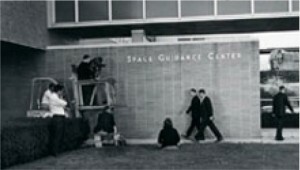 Four thousand IBM employees, most of them from the company’s Federal Systems Division, built the computers and wrote many of the complex software programs that launched the Apollo missions and guided them safely to Earth. IBM engineers and technicians at the George Marshall Space Flight Center in Huntsville, Alabama, built the guiding instrument unit embedded in the giant Saturn rockets. At Cape Kennedy, now Cape Canaveral, in Florida, they performed final system tests and helped launch the 3000-ton rocket with its 40-ton payload. 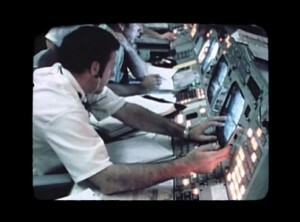 And at NASA’s Manned Spacecraft Center (now called the Johnson Space Center) in Houston, Texas, they sat at consoles beside the NASA flight directors, making the minute-by-minute analyses needed to navigate the spacecraft from Earth orbit to lunar orbit and back. More IBM employees at the Goddard Space Flight Center near Washington, DC, developed the worldwide network of relay stations and ships to track and communicate with the spacecraft. Employees at IBM in Owego, NY, and other locations invented and built the miniaturized integrated circuitry used to shrink the equivalent of an IBM ® System/360 mainframe down from the size of a refrigerator to that of a suitcase—and made it rugged enough to blast into space. IBM acquired the skills and invented the tools needed for space flight over a 30-year span stretching back to the 1940s. The US Navy used an early IBM electromechanical calculator to compute the ballistic trajectories of artillery shells. 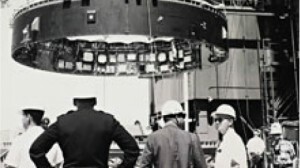 In the late 1950s, the US Naval Research Laboratory employed an IBM 650 computer to solve the orbital math needed to launch small satellites. During this time, IBM built SAGE (Semi-Automatic Ground Environment) [Read more about this Icon of Progress], an early warning radar defense system, and began developing small, heavy-duty computers for bombers and US Strategic Air Command’s intercontinental ballistic missile (ICBM) Titan rockets. By the time NASA began putting astronauts into Earth orbit with its Mercury and Gemini programs, IBM was there with a 60-pound space guidance computer. It used innovative three-dimensional, multilayer etched circuit boards to interconnect components, saving miles of wire and pounds of weight. When the call came from Dr. Wernher Von Braun’s Saturn rocket development team, in search of a guidance system, IBM engineers took one of their Titan rocket computers and modified it for space launch conditions. They then put it in the back of a station wagon and drove it from Owego, New York, to the Marshall Space Center in Huntsville, Alabama, plugged it in, and ran it for a year without a glitch. NASA liked what they saw and invited IBM to bid on the critical guidance system for the Saturn. NASA wanted a system with a guaranteed mean-time-between-failure of 25,000 hours, and a component density—number of transistors, circuits, semiconductors—of 45,000 per cubic foot. IBM came back with a design for a mean-time-between-failure of 40,000 hours and a component density of 250,000 per cubic foot. IBM won the contract and built 27 Saturn instrument units. Each unit became a 3-foot-high section of the 360-foot-long rocket, sitting on top of the third stage. The IUs, as they were called, did their duty. On one of the early Saturn I flights, when one of the rocket’s eight engines failed, threatening the mission, the IU compensated for the change in thrust by adjusting the other seven engines, saving the flight. On Apollo 12, the Saturn V rocket was struck twice by lightning, temporarily knocking out communications with Mission Control and the flight instruments in the astronauts’ command/service module. The IU, however, kept on working and kept the rocket on course. Much less visible was the IBM army of programmers and systems analysts who pioneered the bridge between the theory of celestial mechanics and the prosaic numbers needed to launch the expedition, see it gently land on a moving target 240,000 miles away, and bring it back to within a few miles of a recovery ship in the Pacific Ocean. 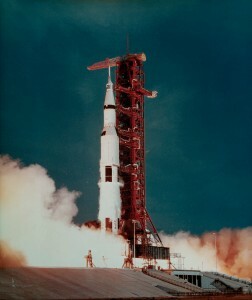 IBM programmers at the Marshall Space Center and Cape Kennedy helped build the IUs and write the programs that launched the Saturn rockets into translunar trajectory. Programs written by the team at Goddard established a worldwide tracking network of 17 stations and four ships that followed and communicated with the spacecraft. 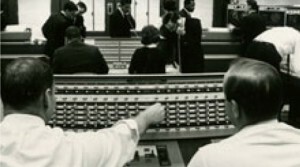 And at Mission Control in Houston, a large group of engineers and programmers worked with five IBM System/360 Model 75 computers in NASA’s Real Time Computer Complex. Every bit of data on the mission’s velocity, flight path angle, and time and position of impact was monitored and calculated constantly. The re-entry trajectory for Apollo 11—which had to hit a narrow six degree line of flight to safely return to earth—was calculated and recalculated some 400 times during the mission. Apollo 11, with Armstrong, Aldrin and command module pilot Michael Collins aboard, landed in the Pacific Ocean on July 24, 15 miles from its recovery ship. Before the program ended in 1975, Apollo made six lunar landings, and twelve astronauts walked on the Moon. It is the only time in history that humans have visited another celestial body. 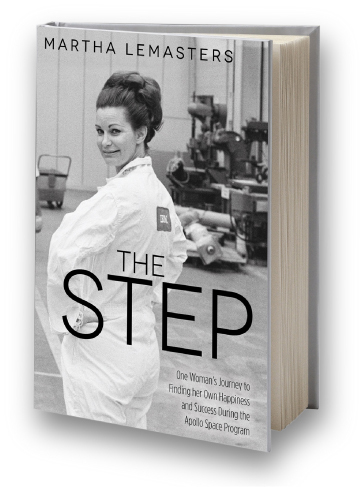 My book, The Step, a memoir about my years working on the Apollo Program, will be available through your favorite bookstore, or online, beginning Tuesday, April 5th or at: Amazon, Barnes & Noble, Books-A-Million, Chapters, Indie Books, and Powell’s. You can also order advance copies through this website by late February, or March 2016. The names of the astronauts will forever be inscribed in our history books, but the names of the entire Apollo launch support team at the Kennedy Space Center and the thousands who supported Apollo elsewhere will only be known to a few. It is the technical team, the engineers, analysts, programmers, and yes, even the secretaries and typists who kept the administrative side moving, who are portrayed in this book. This combined team, after achieving an unbelievable goal of putting men on the moon within the 10-year limit set by Kennedy, performed in an exemplary manner. Some believe they were the greatest technological team ever assembled, achieving the most difficult challenge of all mankind to date. The Apollo team faced challenges and temptations like anyone else in the 60’s: divorce, affairs, deaths, three shifts of work schedules, as well as women’s issues, but they also knew how to have fun along the way. Choruses were formed, humorous skits brought laughs to facility dinners, and tennis bets of a lifetime played out on an Apollo stage with human lives on the line, etched with historic backdrops. What was it like to be a part of this history-making event of launching our astronauts to the moon? Fasten your seat belts and journey back to the 60’s for a front-row seat by someone who experienced it all. As a marketing communications writer, it was my job to write about the people who made up IBM’s launch support team for the Apollo Program at Kennedy Space Center. IBM’s Instrument Unit was the brain of the Saturn V vehicle that guided our astronauts on the right trajectory to the moon. 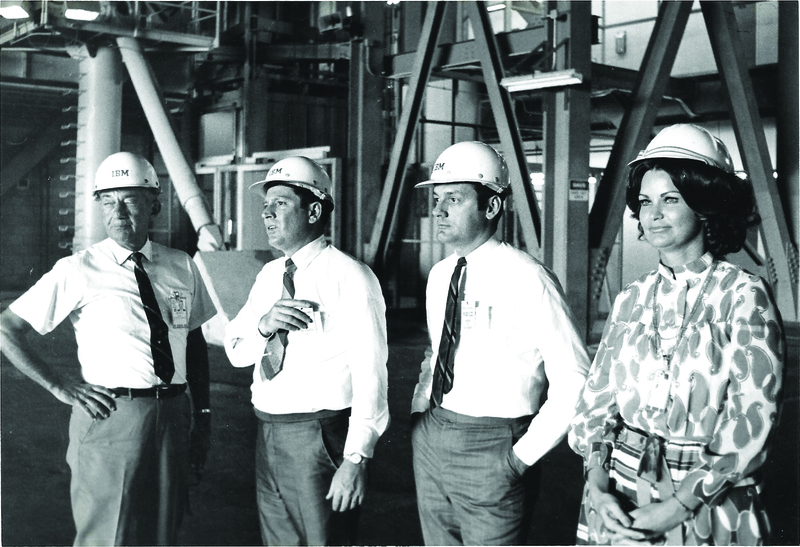 These IBMers played a critical role on one of the greatest technical teams ever assembled in American history. 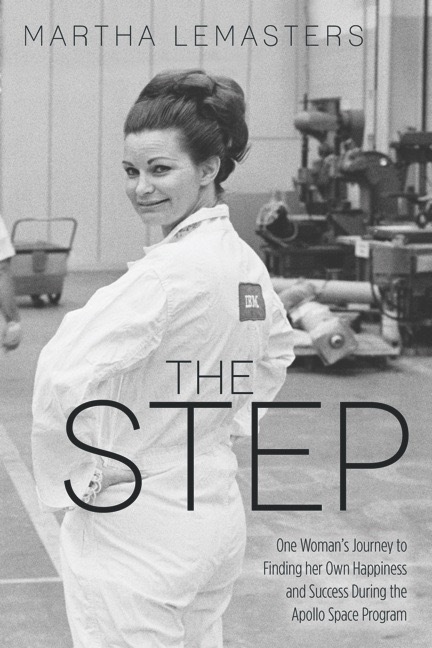 My book, The Step, tells about some of the stories that occurred during this period, including the heartaches, failures, losses and challenges to my teammates and myself. Welcome to my website! You’ll find excerpts from my book as well as additional photos not included in the book.